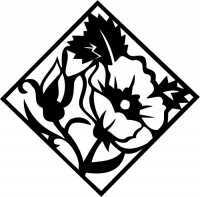 Floral Diamond Decorative (H) graphic - sticker/decal. Normally cut from window etch vinyl (it looks like sandblasted glass), but can be cut from any colour, if you require a different colour please leave a note at checkout. Can be applied to walls and doors as well as windows, in fact any solid non waxy surface.